The Centre was originally established in Parkville at the Commonwealth Serum Laboratories (CSL), a Government body responsible for the production of vaccines, anti-venoms, penicillin, blood products and other human and animal health products for the Australian population. CSL was designated as a WHO Influenza Centre in 1951, not long after the formation of WHO and the WHO World Influenza Centre at the National Institute for Medical Research (NIMR) in London in 1948. The US Centers for Disease Control and Prevention (CDC) and the World Influenza Centre were designated as WHO Collaborating Centres working on human influenza in 1956 and 1957, respectively. In 1992, under the leadership of Professor Ian Gust as director and Dr Alan Hampson as deputy director, the Centre at CSL also received designation as a WHO Collaborating Centre for Research and Reference on Influenza, the third globally and the first in the southern hemisphere. CSL continued to host the Centre after it was privatised as CSL Limited in 1994. 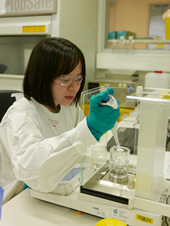 In 2005, the Australian Government announced that it was providing $23.2 million over four years to establish the Centre with a new host organisation and, on 1 December 2006, responsibility for the Centre was passed to the Victorian Infectious Diseases Reference Laboratory (VIDRL), a division of Melbourne Health. Following Alan Hampson's retirement in September 2005, Dr Ian Barr was appointed as deputy director of the Centre and then, with the transition to VIDRL, Professor Gust retired in 2006 and Professor Anne Kelso commenced as director in February 2007. In December 2008, the Centre left its rented premises at CSL Limited in Parkville and moved into new, purpose-built PC2 and PC3 (BSL2 and BSL3) facilities at VIDRL in North Melbourne, close to the Royal Melbourne Hospital and the University of Melbourne. In April 2014, the Centre, along with the rest of VIDRL, moved to the Peter Doherty Institute for Infection and Immunity, a partnership between the Royal Melbourne Hospital and The University of Melbourne. In April 2015, Anne Kelso resigned from her position as Centre Director. Professor Kanta Subbarao commenced as Centre Director in November 2016. The Centre is supported by the Australian Government Department of Health through a funding agreement between the Commonwealth and Melbourne Health. The Centre reports biannually to the Department and annually to WHO.